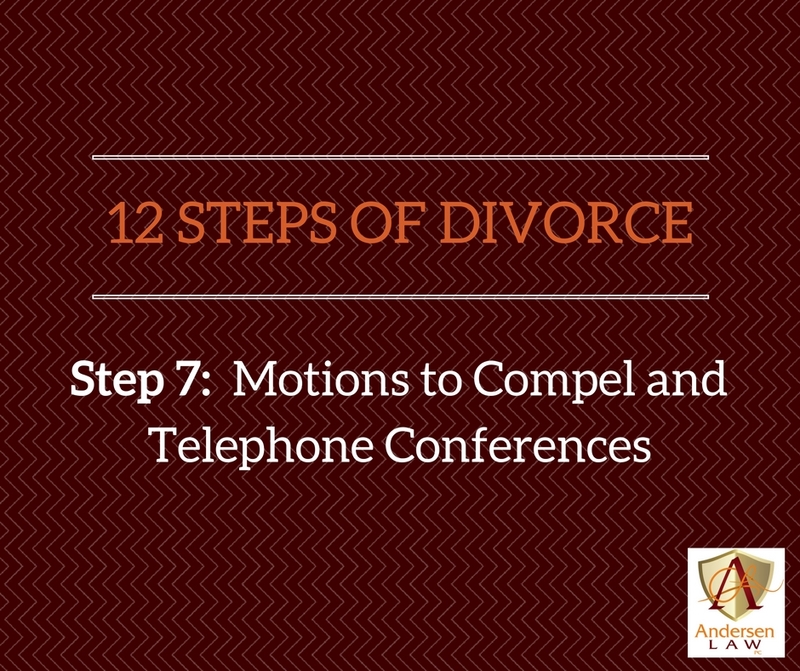 “What the heck is a Motion to Compel?” Draco DeVille shouted into his cell phone to his buddy Art Aingel. Both of them were going through divorces. While neither of them were enjoying the process, Art and Angela Aingel’s divorce had been relatively calm. Draco and Desdemona DeVille’s divorce, however, seemed to be spiraling out of control. The DeVilles’ legal bills were well into five figures each and growing every day with seemingly no end in sight. Art tried to get a word in, explaining that it sounded like routine information his own attorney told him to turn over in Discovery and 16.2 Disclosures. But there was no interrupting Draco. Art got the feeling he could set the phone on the table and walk away and Draco would be none the wiser. Draco was well into his rant and did not so much as take a breath, it seemed. Art listened with interest, wondering himself what a Motion to Compel might be. It sounded ominous. Art’s own attorney told him to fully answer the Interrogatories and Requests for Production served on him, as well as turn over complete 16.2 Financial Disclosures that documented the conclusions asserted in his Sworn Financial Statement and Supporting Schedule, including all the information described in his JDF 1104 Certificate of Completion of Disclosures. Art had marked up his Form 35.1, making sure to provide everything required well ahead of the deadline. Well, at least Sasha is young, Art thought to himself. With Draco thinking it was fine to keep skipping court, Art immediately realized that he should never miss an appearance. His new-found approach of taking everything Draco did and doing the opposite was working well for him. Art’s attorney informed him that he need not worry about Motions to Compel and telephone conferences. The attorney explained that a Motion to Compel is filed in order to do exactly what it says: compel the other party to do something. In divorce, this usually meant having to turn over disclosures or documents or to make discovery responses more complete. So far, the attorney explained, both Art and Angela had fully provided all requested information and therefore they avoided motion practice on Discovery; the time, hassle and legal expenses that motion practice would entail; and the potential wrath of the judges and magistrates who did not particularly enjoy officiating such disputes. That is why when attorneys are involved, there is a Duty to Confer before even filing such a motion, the attorney added. Courts want to be sure the parties and attorneys talk things out, think things through and try to reach agreements about Discovery disputes on their own before involving the courts. 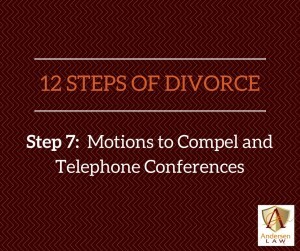 That’s also why courts are encouraging telephone conferences for disputes like this, Art’s attorney further clarified. It is a chance for the court to short cut motion practice and get the case on track without wasting a lot of time and expense for motion practice, briefs and court appearances, all of which are a lot more expensive than simply buckling down and providing the documentation in the first place. A Motion, it turned out, is a legal paper asking the court to do something. The content of the Motion recites the law on point regarding an issue and also includes the facts that will be proven at hearing. The other party must file a Response to the Motion and then the person making the Motion gets to file a Reply. After all this, the parties may end up in court with a hearing where they take the stand and put in evidence to support the facts in the Motion and Response. All Art could think is that this process sounded tremendously time consuming, stressful and expensive. Art was glad that Angela and he had done their homework and avoided more trips to court. It made sense to him, after all, that they needed to know what they owned in order to divide it fairly. That is what he wanted at the end of the day: to be fair. To make matters worse, the attorney concluded, a party might be subject to sanctions if it turned out they were supposed to provide information and did not do it. Sanctions could include paying the other person’s attorney fees, being denied the ability to offer evidence and hearing and even, in the case of contempt, the risk of a fine or jail sentence! Art had not liked it when his attorney had pushed him hard to turn over all his financial information for his discovery and disclosures. But now he was happy he had done everything. Again, it was the right thing to do to be fair. And he sure did not want to pay anything extra or get in trouble, even if all of Angela and his money came out of the same pot at the end of it all. Meanwhile, across town, Desdemona and Angela sat on the bench by the country club where they had just finished a less-than-heated round of tennis. The whole time, Desdemona had been boasting about her own motion to compel and whining about the motion to compel Draco had served on her. Desdemona then began to brag about Temporary Orders. Angela wondered what that mysterious term meant. It sounded like something from the military, like, ‘I have temporary orders to report for duty.’ She decided to ask her attorney. Questions for August: It’s only temporary: What are Temporary Orders and will you need them in your case?